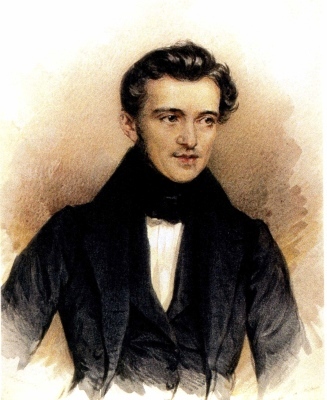 Johann Strauss the Elder, Europe's leading conductor and composer of dance music and the first of the great international 'pop' idols, was born in Vienna on 14 March 1804, the son of a humble innkeeper. A largely self-taught musician, the 13-year-old Strauss reluctantly undertook an apprenticeship in bookbinding, studying the violin in his spare time. He also played in the popular orchestra of Michael Pamer (1782-1827), leaving it when he was only fifteen to join a Trio recently formed by another ex-member of Pamer's band, Joseph Lanner (1801-43). This ensemble grew to a small string orchestra under Lanner's direction until, in 1824, demand for its services necessitated the formation of a second orchestra, under 'vice-conductor' Strauss. It was Lanner and Strauss who, with their contrasting styles, became the true architects of the Viennese Waltz. In September 1825, Strauss departed with some of Lanner's musicians to form his own orchestra. Such was the fame which he brought to himself and Vienna that in 1846 the Austrian Emperor bestowed upon him the prestigious title k.k. Hofballmusik-Direktor (Imperial-Royal Director of Music for the Balls at Court). An astute businessman and showman, Strauss understood the value of touring with his music and together with the Strauss Orchestra he became a familiar figure throughout Europe. He paid two highly successful visits to Great Britain (in 1838 and 1849), after the latter returning to Vienna where he died on 25 September 1849 from the effects of scarlet fever, contracted from one of his seven illegitimate children. His legal wife had borne him six offspring, three of whom - Johann II (1825-99), the future 'Waltz King', Josef (1827-70) and Eduard (1835-1916) - were to develop and spread the family's music around the world. Although he composed around 300 works, he is chiefly remembered for the lovely waltz Loreley-Rhein-Klänge (1843) and for the ubiquitous Radetzky-Marsch (1848) which honours the eponymous 82-year-old Commander-in-Chief of the Imperial Austrian army.